How Is It Different From Mainstream Smoke? Sidestream smoke (SSM) is defined as the smoke that is released from the end of a burning cigarette, cigar, or pipe. Sidestream smoke is different from another term called mainstream smoke (MSM). Mainstream smoke refers to the smoke that is inhaled by a smoker and then exhaled into the environment. When the terms environmental tobacco smoke or secondhand smoke are used, they include both sidestream and mainstream smoke. We hear a lot about secondhand smoke—also referred to as environmental tobacco smoke (ETS)—but these newer terms such as sidestream smoke and mainstream smoke can make this controversial topic even more confusing. What do these terms mean, and what risks do they carry? Since roughly 85 percent of secondhand smoke is sidestream smoke, both people who smoke and non-smokers nearby have similar exposures to environmental tobacco smoke. Sidestream smoke is also a danger for a longer period of time. Mainstream smoke exposure ends when someone puts out their cigarette, but sidestream smoke can persist—affecting both smokers and non-smokers for the remainder of the time spent in a room. Benzene - Benzene is a carcinogen (cancer-causing agent) which is thought to cause leukemias and lymphomas. It can also damage the immune system, raising the risk of infections. Formaldehyde - Formaldehyde is linked with both nasopharyngeal carcinoma and myeloid leukemias. Formaldehyde can also paralyze the cilia, the small hair-like structures that line the respiratory tract to catch toxins and push them back into the mouth to be swallowed. This can result in other substances in smoke gaining access to the deeper regions of the lungs where they can do damage. Nicotine - Nicotine by itself does not appear to cause cancer but may work along with other toxins to result in the changes which create cancer. Nicotine may also aid in the progression and spread of cancer. The amount of these chemicals in the air can differ between sidestream smoke and mainstream smoke. One difference is caused by the incomplete burning of tobacco which results in higher concentrations of the chemicals carbon monoxide, 2-naphthylamine, 4-aminobiphenyl, and N-nitrosodimethylamine than in the mainstream smoke that a smoker exhales. Much of the research in this area has been done on mice, but the implications for humans are plenty alarming. Sidestream smoke affects the autonomic nervous system – the part of the nervous system that regulates the heart and influences blood pressure and heart rate. It also damages the large airways (the bronchi) and the smallest airways (the alveoli) of the lungs. Sidestream smoke also produces a greater number of leukocytes, which are the white blood cells in our immune systems that respond to abnormal substances in the body and fight infections. Secondhand smoke (combining SSM and MSS) results in 150,000 to 300,000 lower respiratory in infants and children less than 18 months, and 7,500 to 15,000 hospitalizations every year. Sidestream smoke has also been found to decrease the elasticity (flexibility) of the lungs. inhibit weight gain in developing animals, and increase susceptibility to (and severity of) respiratory infections like the flu and the common cold. The long-term damage from sidestream smoke includes the promotion of atherogenesis – the build-up of plaque in arteries which can result in conditions such as heart attacks and strokes. It's estimated that secondhand smoke (again combining SSM and MSM) results in 46,000 heart-related deaths in non-smokers in the U.S. every year. It may even predispose babies who are exposed in utero (while in the womb) to early heart disease. Sidestream smoke causes sperm mutations in male mice. There is no safe level of sidestream smoke exposure. In fact, the Environmental Protection Agency (EPA) has classified sidestream smoking as a class A carcinogen, meaning there is enough data to indicate they cause cancer in humans. Sidestream smoke is a concern for anyone, but certain people are at greater risk. Pregnant women and young children have an increased risk, due both to these being time periods of rapid cell division, but also because unborn babies and children simply have longer to live with whatever damage occurs. For most cancer-causing agents, there is a latency period—the period of time from which exposure to a carcinogen occurs and the time cancer develops. If the average latency period for a chemical is 30 years, this is of greater concern for a 2-year-old than an 80-year-old. Another group of people at increased risk are those with medical conditions, especially heart and lung-related diseases such as asthma, COPD, lung cancer, and coronary artery disease. Cancer risks related to secondary smoke including SSM have only recently been studied intensively, but we know a few things. Exposure to secondhand smoke increases the risk of lung cancer, and roughly 3,000 cases of lung cancer in the United States each year are related to this exposure. Sidestream smoke may also increase the risk of breast cancer. In one study it was found that exposure to sidestream smoke was just as important as active smoking (being a smoker) when it came to breast cancer risk. 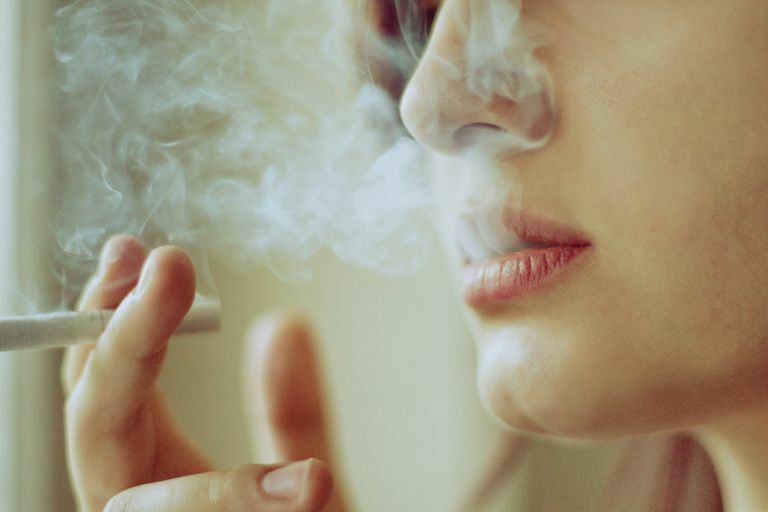 When looking at women who had a life-long exposure to secondhand smoke, their risk of developing premenopausal breast cancer was around twice as likely as those who were not exposed to secondhand smoke. Sidestream Smoke vs Mainstream Smoke – Which is Worse? According to the American Lung Association, sidestream smoke may be more dangerous for two reasons: The concentration of chemicals is higher (since they are burning at a lower temperature,) and it produces smaller particles which may more easily enter and penetrate the tissues in our bodies. While some people may think of cigar smoking as less dangerous it may be even more dangerous to the non-smoker lurking nearby. Since cigars typically burn longer, they give off greater amounts of secondhand smoke than cigarettes. For those who smoke cigars, it's important to learn about the research that has looked specifically at cigar smoking and lung cancer. After sidestream smoke disappears visually and dissipates into the environment, is the risk gone? For example, if you enter a room in which someone had been smoking days or weeks earlier, is there any danger? Nobody is certain exactly how much of a problem it is, but what has now been coined "thirdhand smoke" has many researchers concerned. It’s likely that thirdhand smoke is much less dangerous than sidestream smoke, but until we know more, avoiding thirdhand smoke as well as sidestream smoke may not be a bad idea. If you or a loved one smoke, learn more about smoking and cancer, and form a plan to quit today. Hartney, J., Chu, H., Pelanda, R., and R. Torres. Sub-chronic exposure to second-hand smoke induces airspace leukocyte infiltration and decreased lung elastance. Frontiers in Physiology. 2012. 3:300. Johnson, K. et al. Active smoking and secondhand smoke increase breast cancer risk: the report of the Canadian Expert Panel on Tobacco Smoke and Breast Cancer Risk (2009). Tobacco Control. 20(1):e2. Kwon, K., Jung, H., Hwang, I., and W. Choi. Evaluation of Bronchiolar and Alveolar Cell Injuries Induced by Short and Long-term Exposure to Sidestream Smoke. Korean Journal of Pathology. 2012. 46(2):151-61. Marchetti, F. et al. Sidestream Smoke is a Male Germ Cell Mutagen. Proceedings of the National Academy of Sciences of the United States. 2011. 108(31):12811-4. Olivo-Marston, S. et al. Childhood exposure to secondhand smoke and functional mannose binding lectin polymorphisms are associated with increased lung cancer. Cancer Epidemiology Biomarkers and Prevention. 2009. 18(12):3375-83. Reynolds, P. et al. Passive smoking and risk of breast cancer in the California teachers study. Cancer Epidemiology Biomarkers and Prevention. 2009. 18(12):3389-98. Sharma, P., Koawole, A., Core, S., Kajon, A., and K. Excoffen. Sidestream smoke exposure increases the susceptibility of airway epithelia to adenoviral infection. PLoS One. Epub 2012 Nov. 15. Valenti, V. et al. Sidestream cigarette smoke and cardiac autonomic regulation. International Archives of Medicine. 2013. 6(1):11. Villablanca A., Pinkerton, K., and J. Rutledge. Maternal and neonatal exposure to environmental tobacco smoke targets pro-inflammatory genes in neonatal arteries. Journal of Cardiovascular Translational Research. 2010. 3(6):696-703. How Does Secondhand Marijuana Affect Health and Drug Testing?